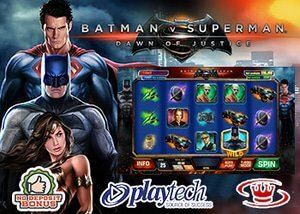 Playtech has been creating some of the most amazing video slots in the industry for a number of years and with the new Batman vs Superman: Dawn to Justice slot, players will enjoy the thrills of a superhero themed game. Featuring multiple paylines, great bonus rounds and high payouts, this progressive slot is being featured at leading Playtech Casinos. This exciting new game is one that will appeal to many video slot fans and as a new release, it can be enjoyed with Playtech no deposit bonuses when new players sign up at a Playtech Casino. Others will find they can enjoy this game for multiple bet amounts and it is a five reel video slot that features 25 paylines. The great thing about this new slot release is that players will have the chance to win one of four progressive jackpots. With this, combined with what can be won from the base game and bonus features, the new Batman vs Superman: Dawn of Justice slot is a game that can prove to be quite rewarding. For those just getting started, we recommend that players try Vegas Red Casino for a no deposit bonus to play this exciting new slot from Playtech Casinos. This amazing DC Comic slot game is one that will turn many heads at Playtech Casinos as it offers many ways to generate superb payouts. There are five different wild symbols that are in use and some are stacked symbols. These can pay as much as 50x the bet when five appear on a payline. There are also shifting wilds in the base game, where Batman and Superman wilds will shift. If these symbols appear, they will remain on the reel and then shift one position on t eh following spin. When both the Superman and Batman wilds appear, this will trigger the Batman vs Superman Free Games. The Batman wild will now become a transformed icon and there will be added wilds. When the round starts, players will choose Batman or Superman and the two characters can engage in battle leaving wilds on the reels. If players have chosen the superhero that wins the battle, they will receive four more free spins. There is also the Dawn of Justice Free Games Feature and this is triggered by a stacked Doomsday wild on the middle reel. Here, the wild will become a shifting stacked wild and can offer some amazing payouts. The highlight of the new Batman vs Superman: Dawn of Justice slot game is the DC Superhero Jackpot, where one of four progressive jackpots can be won at random on any spin. There is no required be amount to win these jackpots and no required combination of symbols. When the feature begins, players will choose from 20 squares and will try to reveal matching energy balls to win the Mini, Minor, Major or Grand jackpots. This fun-filled game can be found at Playtech Casinos and can be played for free or for real money. Those that are betting real money will be able to fund their account using a variety of banking methods. The game can then be played for bets that range from $0.25 all the way to $2,500 per spin, making this a great game for players with any casino budget.